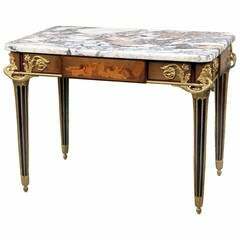 This exquisite marquetry occasional table was crafted in France in the 19th Century, and fashioned in the Transitional style, incorporating both Neoclassical and Rococo elements. 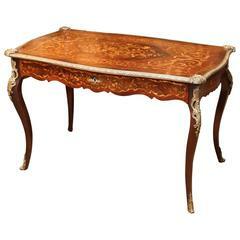 The table is set on four gilt bronze hoof feet, which extend upward to form cabriole legs. These legs, along with the basic frame of the body, have been crafted from oak and veneered in mahogany. Gilt bronze mounts decorate the tops of the legs and upper corners of the main body, taking the form of strapwork, flowers, leaves and crinkled ribbon bows. Marquetry panels, composed of a variety of woods, decorate each of the four sides of the body. The front panel depicts a landscape scene, with a river running through it. In the foreground, on the right, are classical ruins, while in the background left are more modern gabled buildings. This combination conveys a narrative of the passage of time, as experienced in architecture. A man on horseback occupies the centre-left of the composition. This front panel is hinged and can be opened to reveal four drawers. The side panels depict central motifs featuring quivers of arrows, flowers and a pair of doves, and the back piece features a classical vase full of flowers. 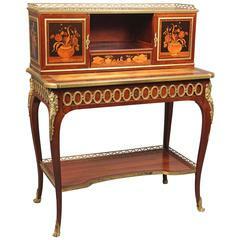 Above the right panel is the handle of a drawer, which can be pulled out to create a gold velvet-covered writing desk. 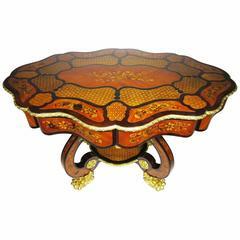 A fifth marquetry design decorates the top of the table. This piece features a central cluster of musical instruments and scores, set against a foliate backdrop, and framed by a double border of flowers. 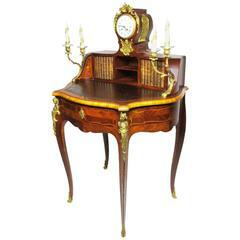 A pierced gilt bronze gallery is set onto the table top. This occasional table would have been created by a highly-skilled craftsman, since the marquetry designs are beautifully composed and incredibly intricate. 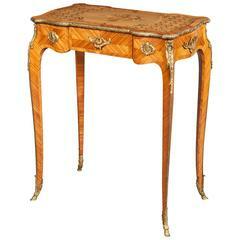 As such, this exceptional piece will serve as a point of visual interest in a traditional interior setting.